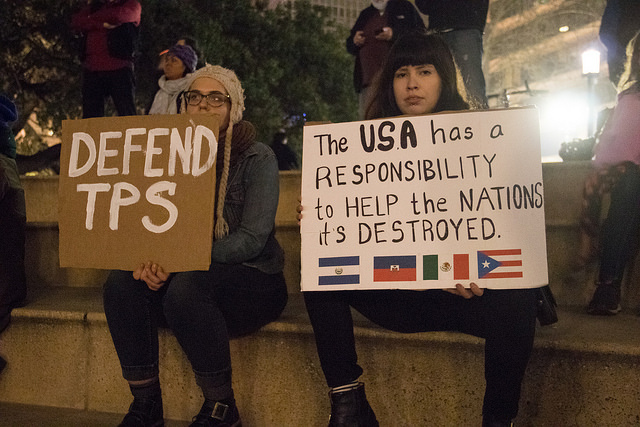 On January 8, 2018, the Trump Administration announced that Temporary Protected Status (TPS) for Salvadorans would expire on September 9, 2019, giving rise to deep uncertainty about the future of the 195,000 Salvadorans who currently hold this status. The stated rationale for rescinding the program is that the original conditions that led El Salvador to be designated for TPS no longer exist. This rationale is problematic because in fact there were multiple reasons for El Salvador’s TPS designation, conditions warranting the designation have persisted, and the rescission will have enormous negative repercussions for individuals, families, communities, and even geopolitical relationships. While some TPSianos, as recipients are known, will be able to qualify for residency through a relative or some other means, without legislative action, most will face a devastating choice between remaining in the United States without status and returning to El Salvador. TPS was created through the 1990 Immigration Act as a remedy for foreign nationals who are in the United States when their countries experiences a national disaster or political conflict that makes it dangerous for them to return. If their countries are designated for TPS, then foreign nationals can pay a fee, submit an application, undergo a criminal background check, and if approved, receive permission to remain in the United States with authorization for a specified period. When this period ends, the Administration must decide whether to rescind or renew the designation. In addition to aiding affected individuals, TPS supports designated countries by preventing deportations during emergency conditions and by enabling TPS recipients to send remittances to family members who may have been impacted. TPS also imposes hardships, however, in that recipients cannot automatically reenter the country if they leave, they cannot petition for family members to join them in the United States, they are not on a path to residency or citizenship, they never know whether their status will be extended or rescinded, and it can be costly—currently $495 per person—to reapply for work authorization. The history of El Salvador’s TPS designation is also intertwined with geopolitics within the region. Although the 2001 earthquakes were a natural event, the United States contributed to the conditions that fueled immigration and that made recovery from the earthquake so difficult. The US government provided extensive military and economic assistance to the Salvadoran government during the 1980–1992 Salvadoran civil war, despite atrocities being perpetrated by Salvadoran authorities. In the wake of the war, the country has struggled with insecurity while the United States deported people with criminal convictions and invested in repressive, yet largely ineffective, gang suppression strategies. Cutting off remittances by deporting Salvadoran TPS recipients will exacerbate rather than alleviate the economic challenges faced by a country that is strategically important to the United States. Moreover, a temporary program such as TPS is an inadequate response to ongoing conditions of deprivation and violence. In rescinding TPS, the Trump administration presumes that it is unproblematic to force Salvadorans to repatriate after almost two decades of absence. This presumption prioritizes national affiliation and formal citizenship over substantive belonging. TPSianos have put down deep roots in the form of homes, US citizen children, businesses, jobs, and study. Disrupting these ties can serve no useful purpose, and indeed will pose hardship not only on TPS recipients but also their employers, relatives, teachers, neighbors, spouses and friends. Moreover, removing Central Americans who are more or less part of the United States lends fuel to accusations that the Trump administration’s immigration policies simply seek to whiten the nation, as suggested by Trump’s comment that he preferred immigrants from Norway to those from “shithole” countries in Africa, Central America, and the Caribbean. The historical precedent set by NACARA, which permitted Salvadoran TPS recipients along with certain other Central Americans and nationals of the former Soviet bloc countries to apply for US residency provides a potential solution to this impasse. When the conditions that prompt TPS designation are not temporary, then TPS recipients, like refugees and asylees, ought to be able to regularize their status. Without such pathways, TPS will continue to exacerbate the waiting and uncertainty that characterize migrants’ lives. *Susan Bibler Coutin is Professor of Criminology, Law and Society and Anthropology at the University of California, Irvine. She is the author of Exiled Home: Salvadoran Transnational Youth in the Aftermath of Violence (Duke 2016), Nations of Emigrants: Shifting Boundaries of Citizenship in El Salvador and the United States (Cornell 2007), and Legalizing Moves: Salvadoran Immigrants’ Struggle for U.S. Residency (Michigan 2000).